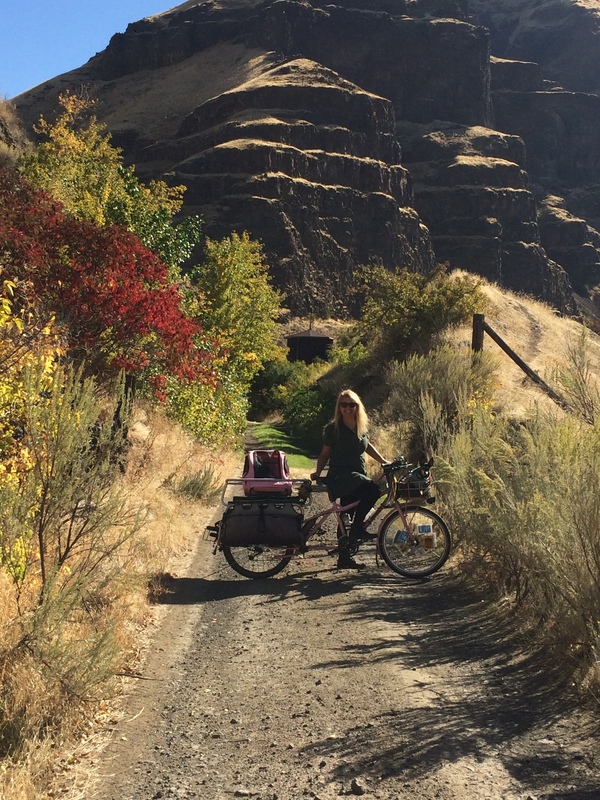 Last month I took my second trip along the Deschutes River Trail. 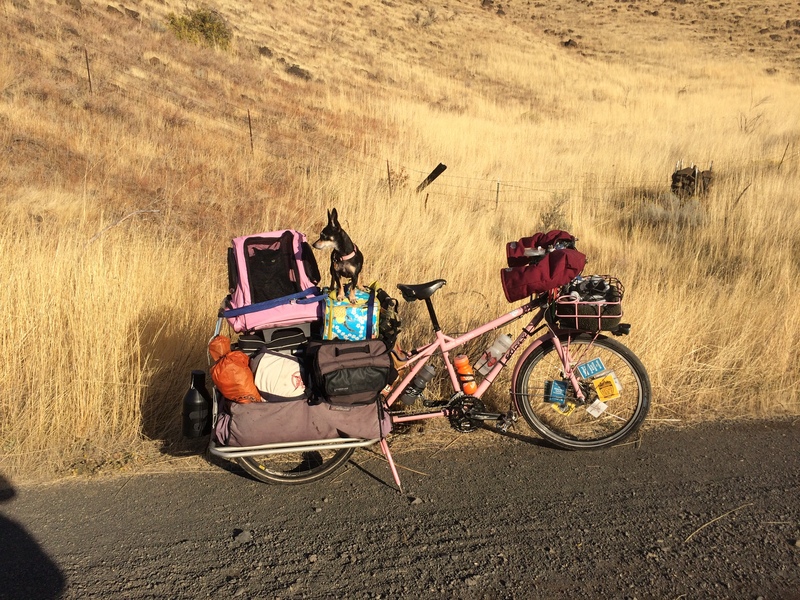 I’d been for the first time in May: Riding the Deschutes River Trail, as well as caught glimpses of the trail and developed a love for the area in March: Dalles Mountain 60 with Pixie. 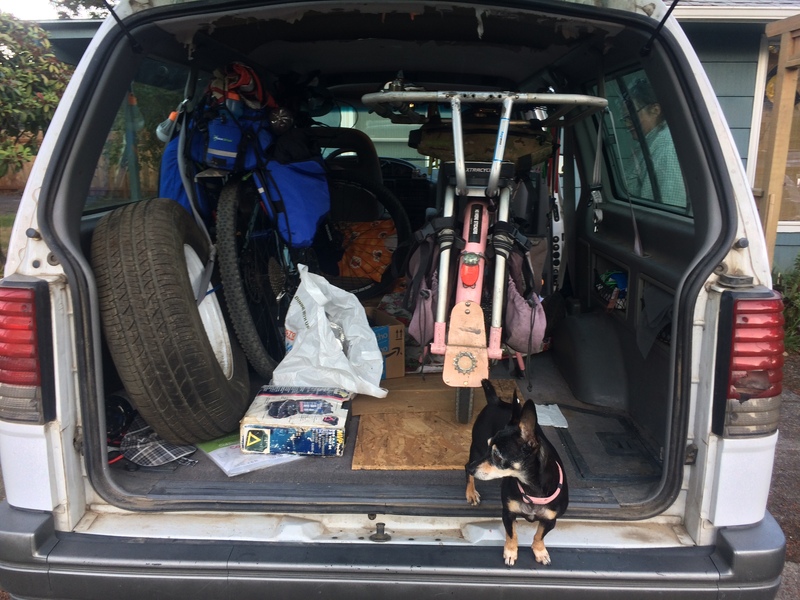 There might be people who bike all the way to the area, but my three trips have involved hitching rides in cars (an hour and a half from Portland or four hours from Seattle). 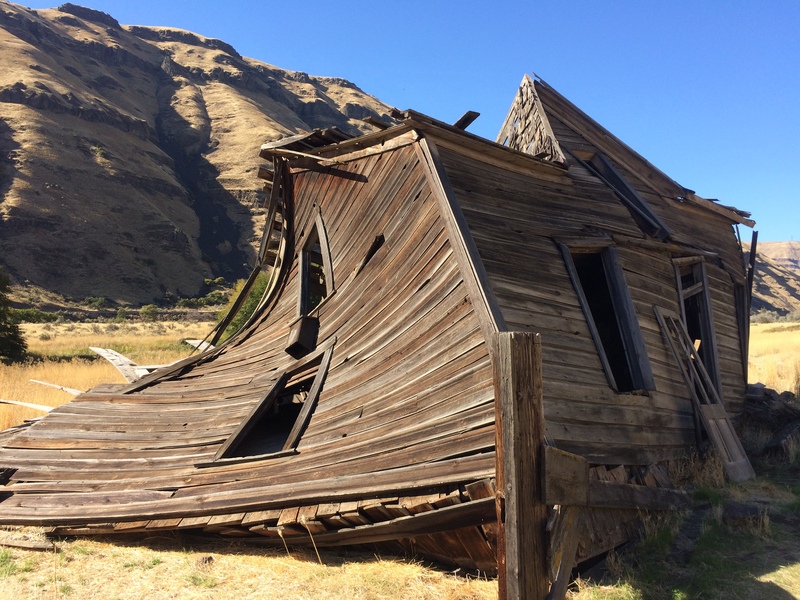 * Strava maps: Deschutes River Trail to Bedsprings Camp, Deschutes River Trail: Bedsprings Camp to the water tower and back, Deschutes River Trail back from camp. 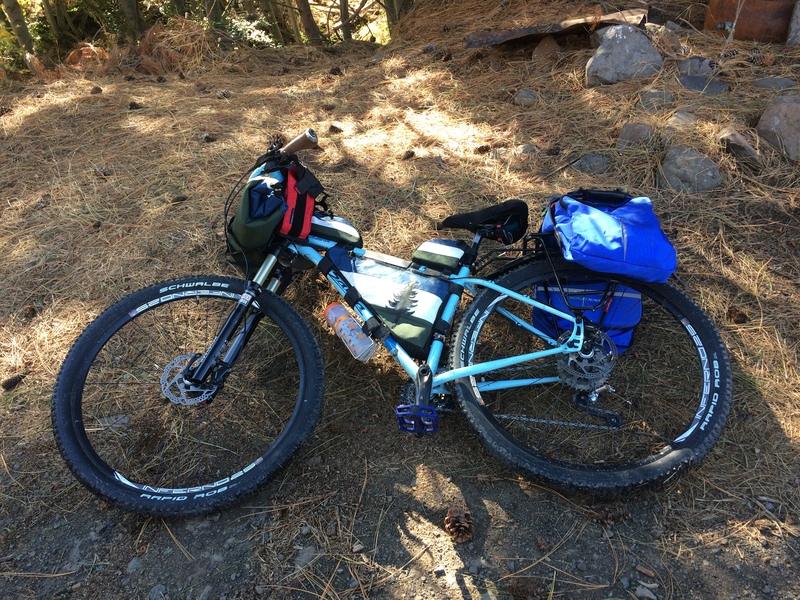 The aforementioned two trips were both on my Surly Straggler with slick Compass Tires (Barlow Pass, 700c x 38mm) and it was perfectly fine, but I wanted to take my mountain bike this time to have even more fun bumping over the gravel. 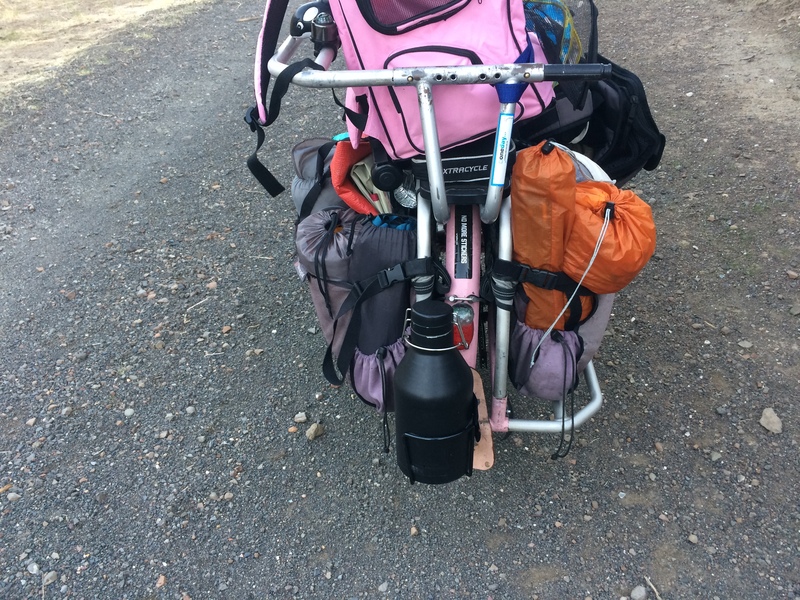 However, carrying stuff for camping on a full-suspension mountain bike (an old one that doesn’t have the option to lock out the shocks) when you are short enough that there’s not a lot of air between saddle and rear tire makes it difficult to load it up with a bunch of gear. I learned that in January when I came down to visit Portland Snow with Pixie. 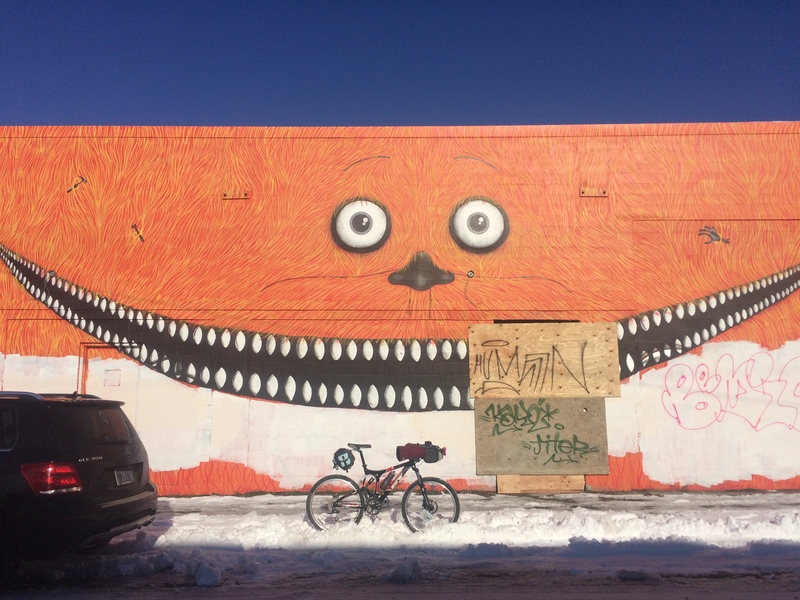 These days I mostly only use my mountain bike for riding in the city snow once a year. I wish I could trade it for an equally old hardtail mountain bike so I could also take it bikepacking. Anyhow, I couldn’t figure out fitting all my stuff on it, especially with wanting to pack water, so I reluctantly gave up on the idea. I had nearly resigned myself to the idea of riding my Straggler again, but then I remembered: I HAVE A SECOND MOUNTAIN BIKE, and a fully rigid one at that! It’s just that it’s also a cargo bike so I mistakenly think of it as a kid hauler and grocery getter. I measured its length and Jolene measured the back of her van and we were both delighted to learn my Surly Big Dummy would fit! I have flat-resistant Schwalbe Marathon Plus tires on the Big Dummy which aren’t knobby mountain bike tires, but I still thought they’d feel fun on the gravel. And the best part is that I could carry Pixie in my front basket and have room to carry Jolene’s awesome new rescue cat, Houdi Joe Pye, on my back Xtracycle FlightDeck in his new backpack. Had I been on the mountain bike, we would probably have each worn our pets in backpacks. Houdi has a basket he rides in on Jolene’s folding bike, but she worried about the low derailleur mixing with the gravel. I got to take a quick spin on her mountain bike, a Salsa El Mariachi, and it was really fun! 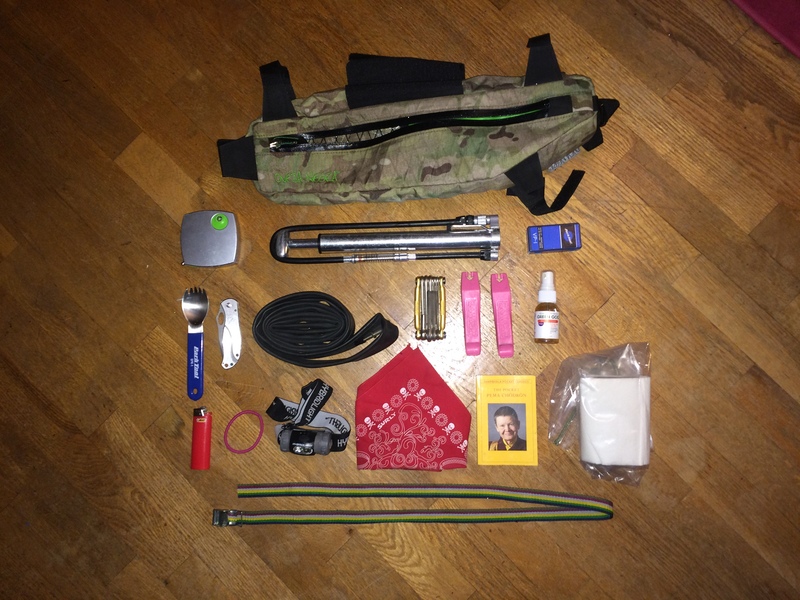 I want to learn to pack less stuff when I camp and bringing the Big Dummy makes it easy to overpack. I decided that since this was my first time camping with no water source I wouldn’t try to pack light water-wise, but I’d practice in other areas. There’s water at the Deschutes River State Recreation Area so we refilled our water there–I had water bottles in my four water bottle cages as well as a growler full of water. I got the growler and velcro-on growler cage from the MiiR store in Seattle. I also brought my water filter because while the water in the Deschutes River isn’t safe to filter due to agricultural run-off, there’s a stream around mile marker 12 we could have filtered. And we would have had to do that had we stayed a second night, as we went through all the water. However, my food would have been different had I been trying to pack lightly and not need lots of water for cooking. Thanks to the Big Dummy I brought my usual meals that required boiling water (pasta for dinner and oatmeal for breakfast) as well full coffee setup. I ended up packed doubly heavy since we decided at the last moment to just camp one night rather than two and I figured I may as well keep my camp kitchen bag packed up with double the food for just in case (Just-in-case food is admittedly part of my overpacking problem). So I also had my no-water-needed can of chili and can opener, double the oatmeal (which I gave to our camp neighbors who didn’t have enough and were camping for two nights), and snacks for days and days and days and days. However, I took a moment to remove my no-water-needed canned coffee (hadn’t decided if I would heat it or drink it cold) which would work for saving both equipment and water space. I’ll try that on some future trip. Maybe. Real coffee is pretty important. So I guess my only light-packing concession was bringing one of my folding Fozzils Bowlz. 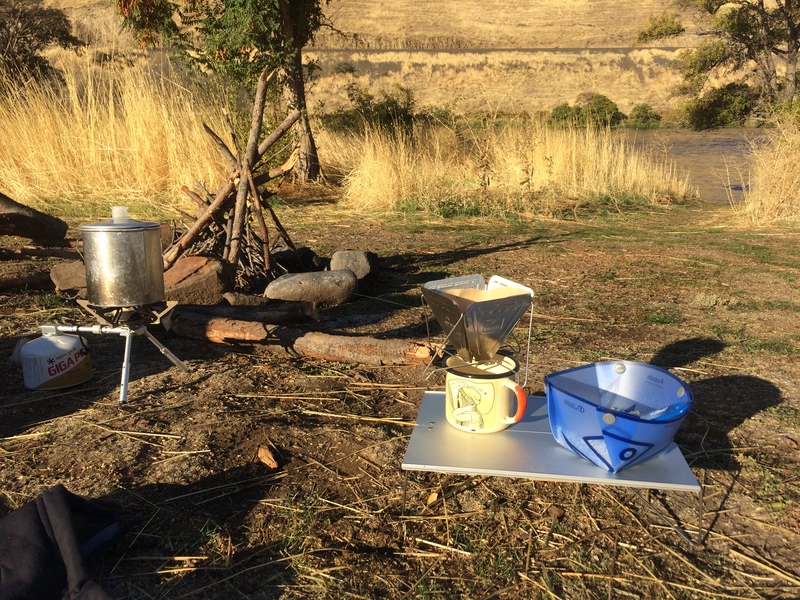 I don’t like to use plastic for warm or hot stuff (and hope to someday avoid it for all stuff), but this thing is pretty nifty and my friend Marley has it in the top spot of her 5 Must-Have Camping Gear Items. Mine is part of a three-pack from a gifted three-month subscription to Cairn which delivered a lot of cool stuff. Before I knew for sure which bike I was bringing, I had loaded up my frame bag with the things I might need to quickly access. It’s a great bag, but my bikes are so small that I can’t easily fit it on them (I’m 5’5″ which isn’t that small, but it’s small enough to feel jealous of tall people and their many options…like the whole saddle bag bumping the rear tire of my mountain bike thing). I also took advantage of the cargo bike and brought a full-sized pillow and a second sleeping pad because I was experiencing quite a bit of temporary back pain. The second sleeping pad was also for warmth as I’m not normally a three-season camper and was pretty scared about being cold overnight. It was heavenly! I might need to figure out a way to do two pads in the future. One of the pads belonged to my eight-year old so I only have access to an extra if I don’t bring the kids along. I see a lot of friends with Therm-a-Rest Z Lites so that looks like a good one to add to our stable. Note: our current camping gear is all listed in my Family Bike Camping Primer. The trail was much like my last visit, except it was too cold to see any rattlesnakes this time, yay! Dispersed camping along the river was new for me (we camped at the recreation area last time) and we shared our site around mile marker 8 with two backpacking women. 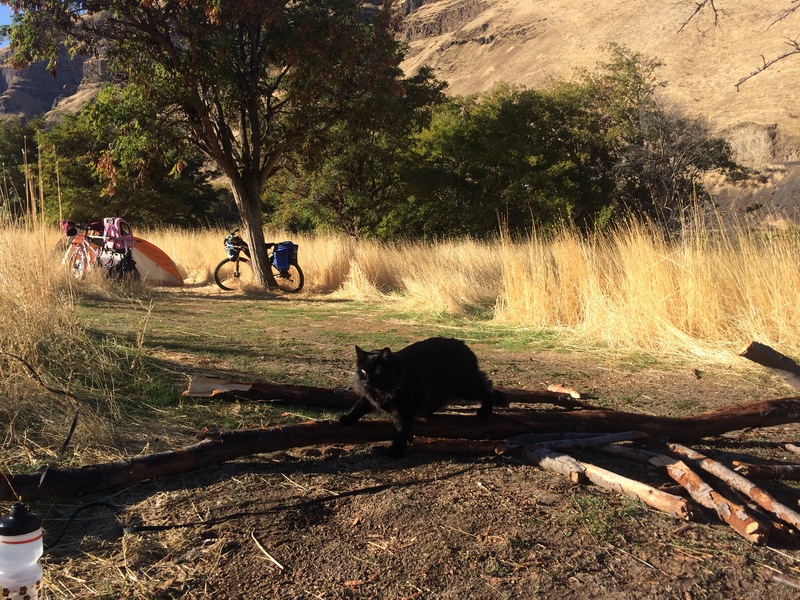 They referred to the campsite by its name, Bedsprings Camp, rather than mile marker which lead me to find this link, Deschutes River Hike, with all the campsites listed by name. I’m not sure the bikepackers know these cool names! 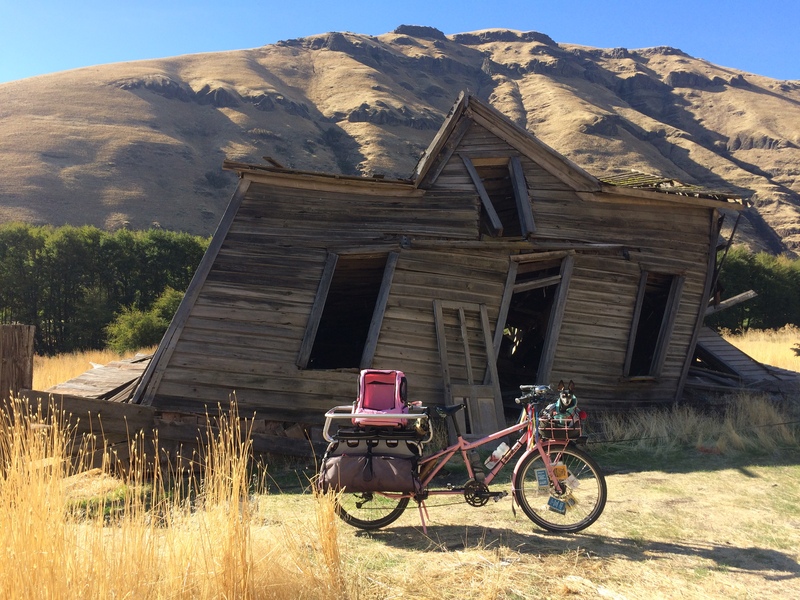 On day two Jolene and I pedaled on from camp to the Harris Homestead and I was glad to see the farmhouse is still standing…though probably not for much longer. This is the spot at which Chele, Kelley, Kelly, and I turned back last time so I was extremely excited to hit some new territory this trip. The trail is still pretty easy to ride to the water tower, but past that is when the gravel gets rougher and there are probably many tire-puncturing goatheads. We discovered more buildings to explore and the creek makes for a pop of green amid the mostly yellow landscape.